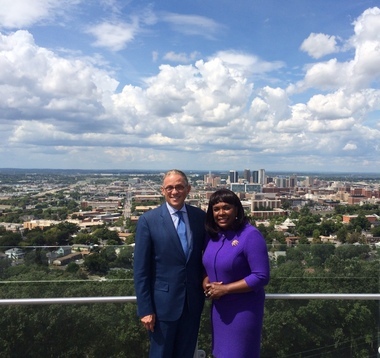 Chairman of the Ex-Im Bank, Fred Hochberg, with Alabama Congresswoman Terri Sewell. The pair toured Birmingham businesses on Sept. 3, 2014. Have you ever had to put out a fire in Dubai? If not, you might not know that Trussville-based Amerex makes many of the fire extinguishers sold in Saudi Arabia. The company was able to get its products overseas thanks in part to services provided by the Export-Import Bank of the United States, known as Ex-Im Bank. Ex-Im Bank has supported 82 Alabama-based companies in exporting overseas since 2008, and 58 of those are small businesses. For a complete list, click here. Chairman of the Ex-Im Bank, Fred Hochberg, visited Birmingham today and stopped for a chat with AL.com. He was joined by Alabama Congresswoman Terri Sewell. Here’s what they had to say. Why is Alabama uniquely positioned to manufacture and export goods? Hochberg: The political leaders and business leaders in Alabama work together. They understand what it takes to support and create jobs. Elected leaders here understand the global economy. They understand you can’t be pro-jobs and not pro-business. Alabama is also home to a lot of manufacturing. People here value and put a premium on American quality innovation. When people see Alabama-made products in Saudi Arabia, what’s the reaction? Sewell: There’s no question that Alabama gets a boost when people are seeing and using our products. It promotes Alabama and truly introduces our state to global market. For Alabama manufacturers, what are the advantages to exporting overseas? Hochberg: It evens out the business cycle. Amerex, for example, is able to keep its workforce steady throughout the year because they have a lucrative business overseas. They aren’t faced with having to lay people off or make people work part time during the slow season because they always have demand for their products. What would you say to companies afraid to seek opportunities internationally? Hochberg: A lot of small businesses worry about getting paid for their products once they ship them overseas. They think, ‘What if I don’t get paid? Will I have to find a lawyer in Saudi Arabia to collect? I’ll spend more in legal fees than the products are worth!’ But we sell credit insurance. We ameks sure they get paid. We either collect or make good. It gives them peace of mind because they know they aren’t jeopardizing their business by branching out. What would you say to a small business looking to export for the first time? Hochberg: If they’ve never exported before, I would direct them to the Commerce Department and to the Small Business Administration (SBA.) They need to find out where their customers are and find a distributor. We can help them once they need financing to close a transaction, but the Commerce Department and SBA can facilitate introductions and let them know if there’s a market out there. * In 2013, nearly 90% of Ex-Im’s 3,413 transactions were for American small businesses. * Ex-Im supports small and medium-sized minority and/or woman-owned businesses. The bank authorized $815.6 million for this category of business in 2013.